« Think Big…Small in the Frame. Hands down my favorite sunrise spot, and as a bonus, a short 5 minute drive from my front door. The fall season is the best time, as some of the very crisp mornings create misty conditions along the Ottawa River’s warmer water. Add layers of trees and tree lines and you got a recipe for amazing silhouette photo opportunities with lots of depth. Here is my favorite from this spot this year, created in October. 9. 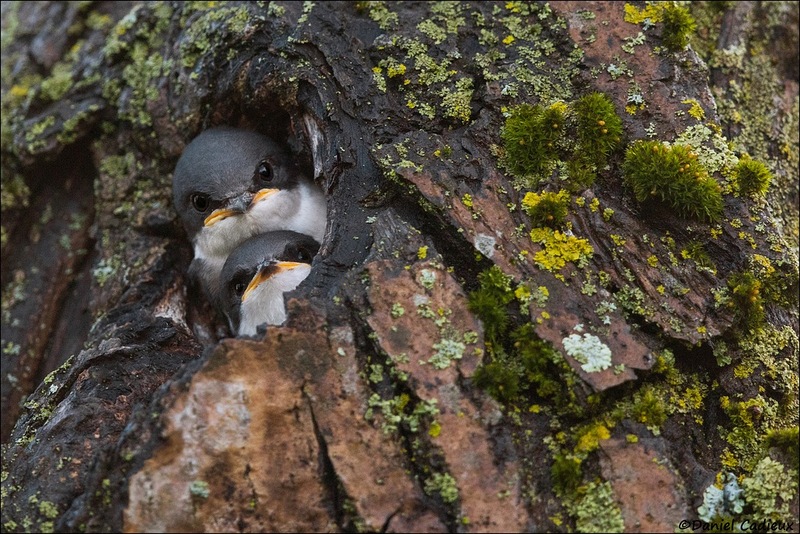 Tree Swallows at Nest. Finding Tree Swallow nests is usually rather easy, but they are usually found in man-built nest boxes. Stumbling upon one in a natural tree cavity, at about eye-level no-less, is a huge bonus. I did not have my camera when I found this nest, so I returned that same evening to photograph the activity. The nestlings were already quite grown, and seemingly eager to venture out. After a successful session I planned on returning first thing the next morning to take advantage of the light that would hit the nest perfectly…when I got there the nestlings had already fledged. Shorebirds are my favorite family of birds to photograph, but this year the conditions at my favorite spots for these guys were abysmal due to very high water levels covering most of the habitat they prefer along the river’s shoreline. One spot I always check seemed promising as there is a lot of habitat even when the water is high. I had struck out on a few mornings, but one final check yielded a couple of Lesser Yellowlegs and a dozen Sanderlings. All it takes is one cooperative subject, so for me this was a bonanza, especially considering the shorebird “drought”. As luck would have it, the flock of Sanderlings began to bathe right in front of me…which only meant one thing for those of you that know bird bathing behaviour: after-bath wing flaps. I had a perfect sight-line to photograph this one from a very low angle, with no other birds in the way. 7. 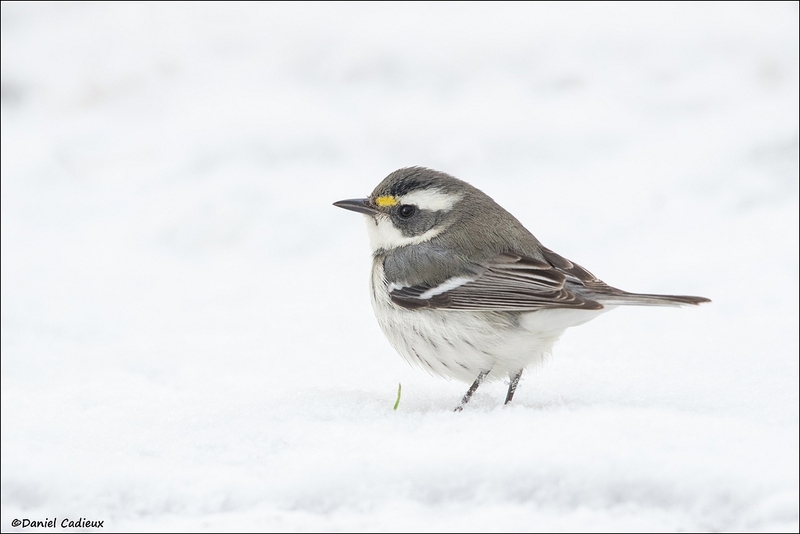 Black-throated Gray Warbler in Snowy Setting. For a few weeks this late autumn / early winter a stray Black-throated Gray Warbler dazzled and entertained many birders and photographers in Ottawa. This bird was a few thousand kilometers off course! As the first snows fell, I had in mind to photograph this warbler foraging int he snow – not something you see every day, and perhaps a once-in-a-lifetime opportunity for me. Most people were hoping it would move on, or at least survive the winter, but most also knew it likely would not if it stayed around too much longer. Well, two days after this photograph, after even colder temperatures blew in and heavier snow fell, it finally succumbed to the harsher habitat that it is not normally adapted to live in. This was a bittersweet image to process (and present as a favorite of 2017) as I now had the images of a warbler in the snow I had envisioned, but also realizing that this is the very situation that brought its’ demise. 6. 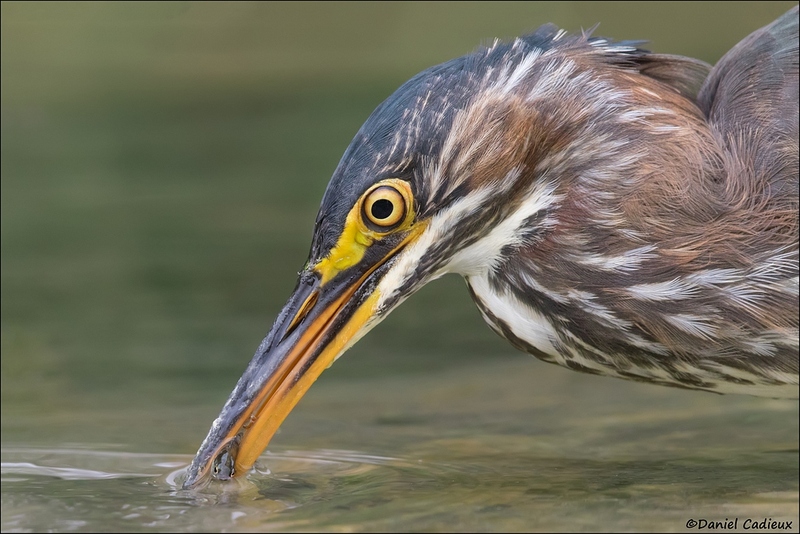 Green Heron Plucking Fish Out of the Water. I love photographing portrait close ups of my subjects, and when you add action or behaviour, then all the better. This very tame young individual allowed close approach and very intimate photo opportunities of its hunting prowess. Timing its’ strikes from so close presented framing challenges while trying to gauge exactly where the impact would occur, but once in a while I got a good image, and here an excellent one. I love the fish still halfway submerged in the water as it is being pulled out, and facing us for added impact. 5. 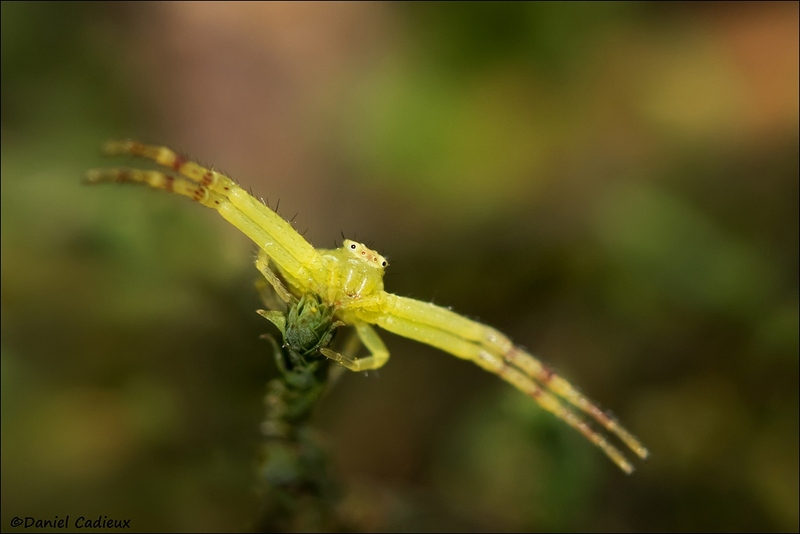 Crab Spider Wanting a Hug. I had just finished photographing my first ever Eastern Towhee, and while walking back along the trail to head back to my car I crossed paths with an Eastern Gartersnake. I had tons of fun and cool photo opportunities with this individual, and when I slapped on the macro lens things got real interesting! For this image I was lying flat on my belly, with the lens pointing up from below the snake’s eyes staring down at me. It was rather disconcerting looking at this scene through the viewfinder, but knowing that this is a harmless species of snake I was not too worried. It was tough to get the autofocus to accurately settle on the eyes, so I manually focused to within “ballpark” and then slowly physically rocked the camera forward and backward a few millimeters until it was bang on and fired a few frames – then repeated as necessary. 3. Andrew Haydon Park Glowing Sky. 2. Northern Cardinal On Delicate Perch. 1. 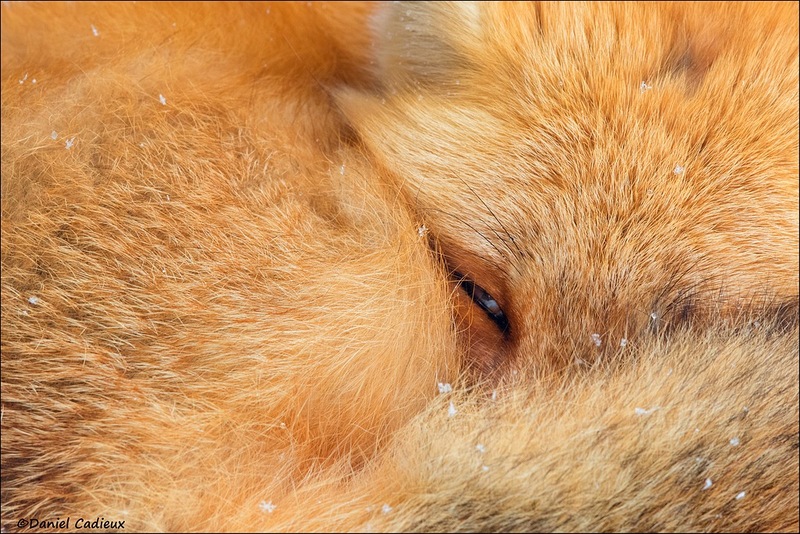 Sleeping, But Watchful, Red Fox. Every time I go to Algonquin Park I end up with an image or two that instantly become personal favorites. 2017 was no exception. In January I went there specifically to photograph a large flock of Evening Grosbeaks that were present, but during a break in the action I went to another area in hopes to see Red Foxes that are usually a hit with visitors during warmer days. It was very cold, and somewhat snowy on this day, and the spot devoid of foxes, or people! After a few minutes, here came a vixen, likely the mate of the older male fox that is well known in the area. She came loping over curiously then settled down under an evergreen to take a nap. I went with the long lens plus a teleconverter and then went down to the ground and belly crawled in the fresh snow over to her until all I got in the frame was what you see below. She slept comfortably, and only opened an eye when branches rubbed together in the wind, or if a snow crunched under my weight as I moved for better comfort or balance. I hope you enjoyed viewing and reading about this year’s “Top 10”! What impressed me the most is that despite being a bird photographer first, half of this list is of subjects other than an avian ones, including 4 out of the top 5. Which one is your favorite? Is there one that surprises you with its inclusion? Let’s see what 2018 will bring……..and with that, have a Happy New Year! Fun to see some of these again. I always enjoy looking at the photos you share. That cardinal is a favorite. Awesome collection Daniel. Thank you for sharing. Thank you for checking the images out! It’s always nice to hear from you Bill. Thank you! I love seeing what beautiful images you have to share with the world. As always these are fantastic. Favourite is hard….probably the Swallows with Petrie Island sunrise second, then fox…..oooh but I love the Cardinal too. So hard to choose. One of my favourites of yours that I don’t see here is the image of 3 or 4 shorebirds running on shore towards the lens. Great work. Can’t wait to see what 2018 brings. Great collection of image. The image of the Black-throated Gray Warbler brought me here. 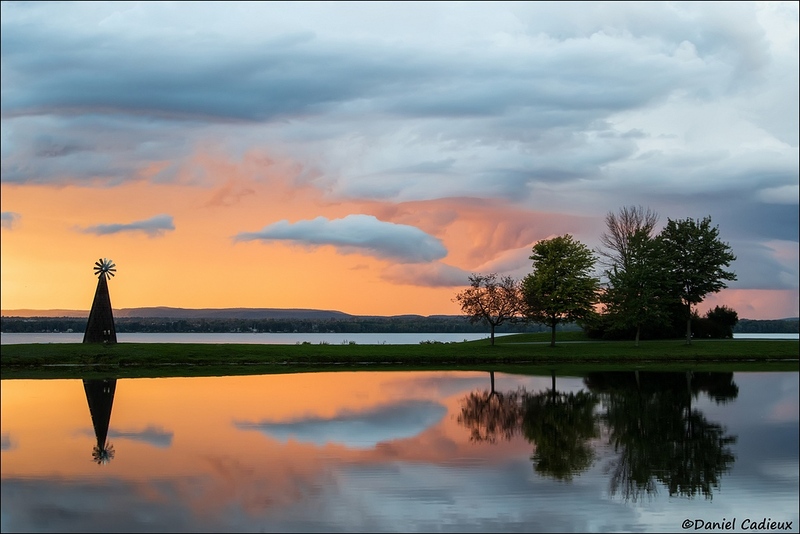 Your Petrie Island sunrise shot is fantastic. 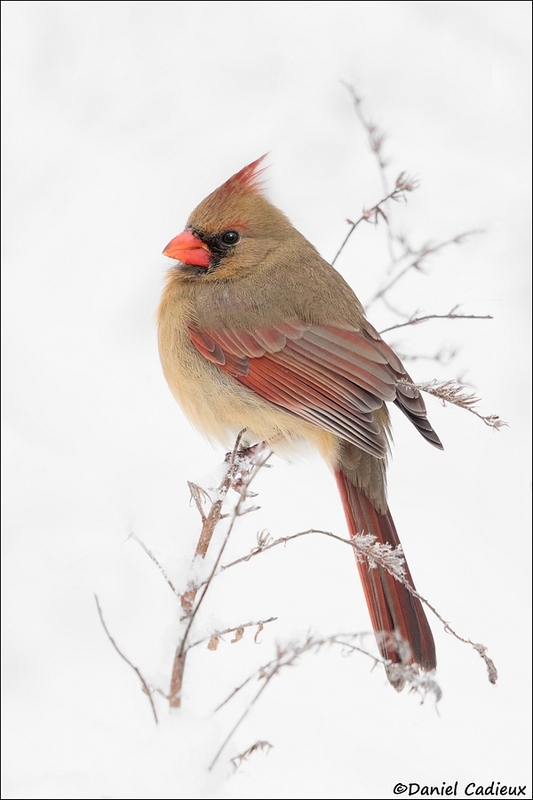 The female Cardinal looks like a postcard! Big fan of your work! Thank you very much for the kind words! That warbler sure caused dome local excitement eh! Too wonderful to pick just one! Have you seen any snow owls yet? Happy New Year! I’ve seen a couple, and only had time to photograph one that sitting on top of an old pick up truck. I love them all so I can’t choose! I also can’t choose what I like the best: your photo’s or your little stories! I always find them interesting and full of info as well as very charmingly written with a lovely personal touch. I think I’d like to print this list and make a little booklet of it if that’s allowed…. I wish you and your family a happy, healthy and succesful 2018! Awesome group of ten! Number 2, the cardinal works best for me. It has so warm light and relaxed feeling. This species cannot be seen in Finland why it also adds interest for me. Happy and Photo Rich New Year! That cardinal image seems to be a popular one. They are a beautiful bird! Hi, thanks so much for sharing your blog and beautiful photography. My faves are your golden hour landscape and the cardinal. All of your photos are wonderful and I really like the young swallows. Thank you very much Sue, and same to you! Dan, such a wonderful and inspiring list of your top 10 images of the year. Your photos really do stand out among the myriad of photos that we see in the course of a year. Each of your images has a special magic about it and if I had to describe what that special element is I would say that you manage to capture “the soul” of each of your subjects whether it’s a living species or a landscape or a skyscape. Happy New Year, Daniel. The artistic nature of your images is always superb, and this year’s list is no exception. Tough to pick a favorite, but I think I have to go with the Cardinal. Thanks for dropping by, Bill, and for the kind comment! That Cardinal sure knew where to perch that morning, glad you like it. Daniel, if I had to pick favorites here I’d say (really in no particular order) #10, #8, #4, and #1. 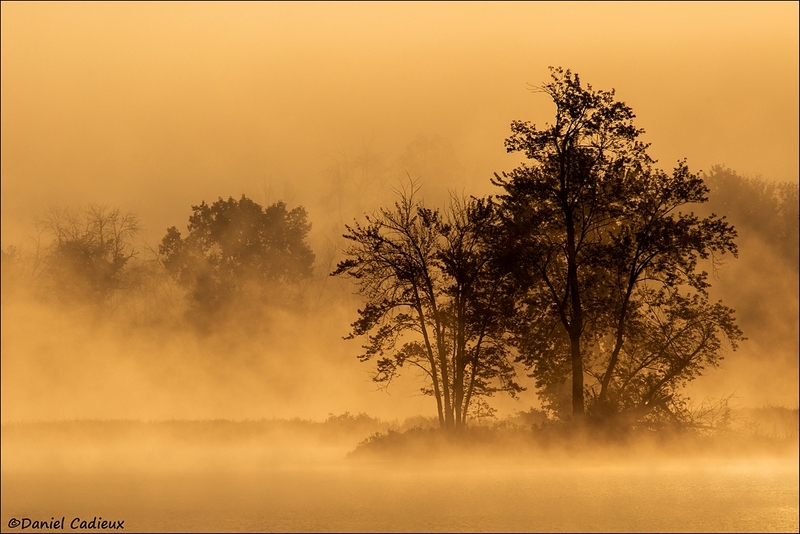 The Petrie Island shot is a beautiful misty landscape bathed in gorgeous light and color. 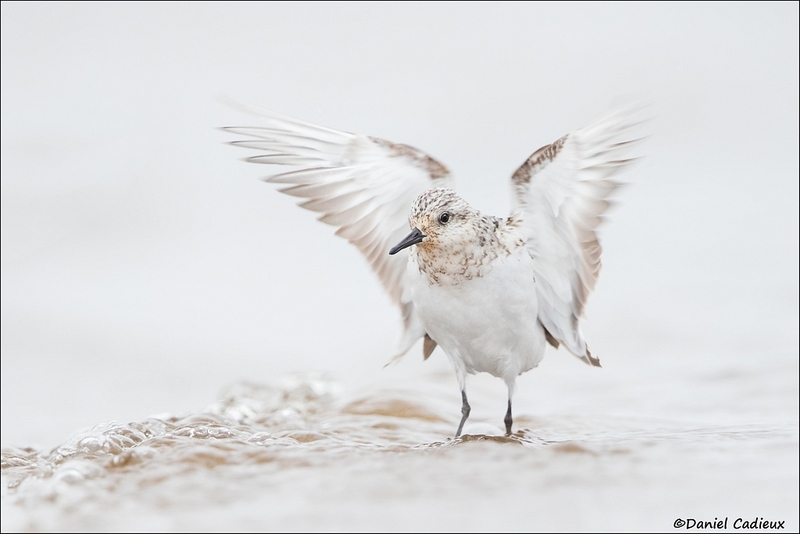 Your commitment to finding shorebirds paid off with the sanderling wing flap in #8. 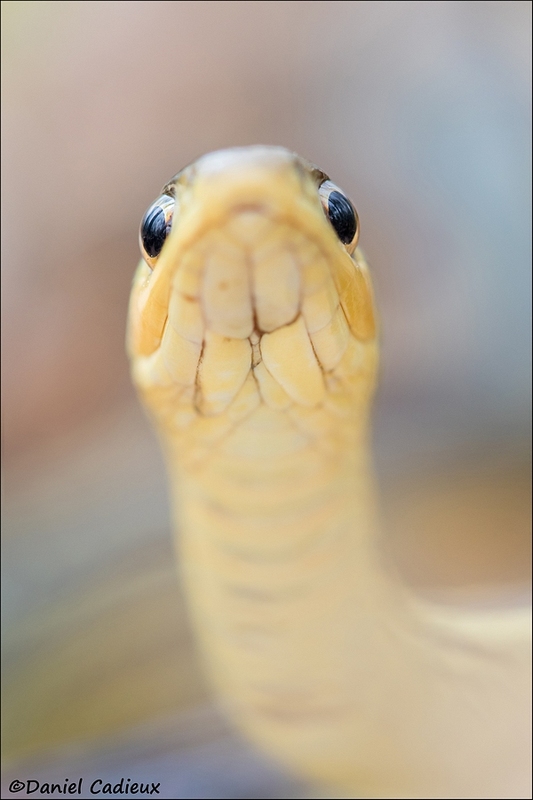 The perspective is great on the “snake eyes”…and I love the inclusion of a snake photo in your top ten. Finally, your red fox shot is amazing! The detail of the fur, the composition, and the watchful eye all combine to make an immediate impact…great “wow” factor. Thanks for taking the time to put this together and share it. I enjoyed reading the post and seeing these images. Noel, thank you for the comment. I never would have thought a snake would eventually make it onto a list so I am happy you like it. See you online! Hi Artie, thank you very much. The cardinal has proven to be the most popular, and those swallows were too cute.